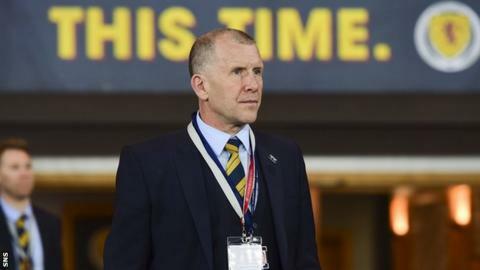 Scottish Football Association chief executive Stewart Regan has stepped down from his position. The 53-year-old, who had been in the post for eight years, says he recognises the "need for change". Former SFA chief executive Gordon Smith described the situation as an "embarrassment". Stewart Regan Q&A: How? Why? Who next? Scotland missed out on qualification for the 2018 World Cup and are searching for a new manager after Strachan's departure in October. There is also uncertainty over where Scotland will play international matches in the future. A decision on whether to renew the SFA's lease on Hampden, which expires in 2020, or relocate to Murrayfield, the home of Scottish rugby, has been delayed until the summer. The SFA also found itself at odds with leading clubs and players last week over its decision to schedule end-of-season friendlies in Peru and Mexico. Expanding on his decision to step down, Regan said in a statement: "While it has been tough, I am proud to leave having overseen a period of significant change and substantial growth. Chief operating officer Andrew McKinlay will manage the day-to-day business during the interim period. SFA president Alan McRae said: "I would like to place on record my thanks and appreciation to Stewart for his commitment to Scottish football. "He has worked tirelessly and has helped drive through a number of improvements to the governance of the game in the country. "The search for a new chief executive will begin immediately as we will continue to drive Scottish football forward on and off the pitch." Scotland have two friendly matches arranged in March, at home to Costa Rica on 23 March and away to Hungary four days later. If Stewart Regan didn't know what kind of world he was about to walk into when he was appointed in 2010, then he would have known it very soon after. A spate of crises descended on him. The ones that spring immediately to mind are the referees' strike and the financial implosion of Rangers and the years of accusation and suspicion that accompanied it. There were others. Almost every month he had grief to contend with. Regan was fighting fires almost from day one. His reputation among football fans plummeted. This is natural. It comes with the territory. It's hard to remember an SFA chief executive who has been popular with the masses. It's a feat that is nigh on impossible in the passionate and rancorous world of Scottish football. The good stuff he did in trying to modernise an archaic association was played down, the bad stuff magnified. Regan was an unpopular presence and recent weeks and months only added to his unpopularity. Scotland once again failed to qualify for a major championship, a run of failure that saw him sack his one-time favourite, Gordon Strachan. He gambled on getting Michael O'Neill as Strachan's replacement - and failed. The announcement of a Scotland summer tour to Peru and Mexico went down like a lead balloon. The inability to find a successor to Vauxhall as national team sponsor was another problem and it chipped away at his credibility. It's too soon to say whether he went of his own volition, tired, perhaps, of the unending brickbats, or if he was removed by a board who had just lost confidence in him. The bottom line, though, is that the national association and the national team are now rudderless. Regan, to an extent, was an easy target. He has gone, but many problems remain.